This long-term environmental project is designed to ensure that Mont St-Michel remains surrounded by the sea, yet enhancing its appearance and accessibility for visitors. People have been concerned about the maritime environment of Mont St-Michel for years. Indeed, Victor Hugo raised concerns in 1884 about the need to conserve "this combined work of nature and art." The 19th century causeway blocks the flow of the sea, and over the years there has been a build up of silt. As a result the sea is receding and the land and salt marshes are encroaching. 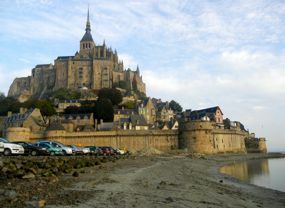 For decades, visitors approaching Mont St-Michel first saw a huge parking lot full of cars at the foot of the ramparts, a sight not in keeping with the island's history or aesthetic appeal. In 2005 the first phase of a massive reclamation effort saw construction of the dam on the Couesnon River. 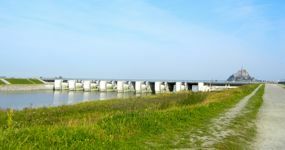 This dam uses controlled releases of water to limit the buildup of silt in the Bay of Mont St-Michel. The dam itself is both an engineering marvel and a work of art, providing beautiful views of Mont St-Michel and education facilities with information about the Bay of Mont St-Michel, its fragile environment, and the reclamation project. something not seen after April 2012. The new visitor approach now features an expanded Tourist Information Centre (Centre d'Informations Touristiques), information kiosks, toilets, and more. 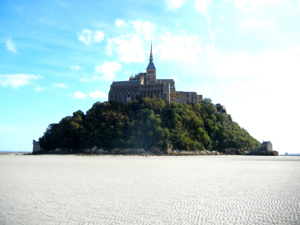 Extensive landscaping provides a beautiful and natural visual backdrop for the approach to Mont St-Michel. Those who prefer to walk from the car parking area (45 minutes) may choose from three walking paths, each with interpretive plaques and beautiful views. The new footbridge, replacing the old causeway, allows water from the sea and the Couesnon River to flow freely around Mont St-Michel, as they historically did. After all, the dramatic tides are part of the mystique of Mont St-Michel. This important project is an investment in the future of Mont St-Michel, ensuring that it remains connected with the sea, and providing enhanced access for future generations. Mont St-Michel in the distance. at low tide, surrounded by sand.